We don't exactly have formal building plans, because most of this is sketched out in my notebook and floating around in my head. Considering that we will be building from timber we harvest on the property, drawing up detailed blueprints is a bit difficult since sizes are largely estimated. So, I'll try to explain what we'll be doing instead (keep in mind that we are building on permafrost) and that we will be building a round house with round (unhewn) timbers. 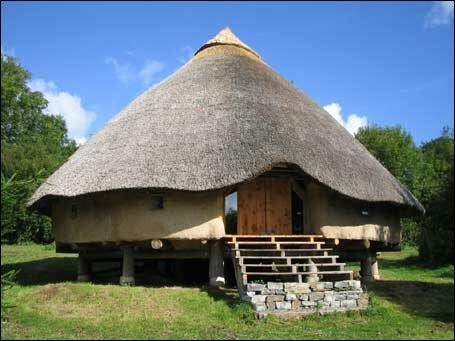 Basic concept: timber-frame/post & beam skeleton consisting of two concentric rings of posts (a.k.a "henges") supporting a conical, reciprocating green roof. The interior skeleton will then be wrapped with straw bales, earthen plastered (clay mud cob), lime plastered and then limewashed inside and out. The house will be 1.5 stories (main & loft) and approximately 20' in radius (1200 sq ft) with an open floorplan. The outer ring will have kitchen, bath, office, bedroom & utility room; the inner ring will be the living room with woodburning heat stove almost directly in the center of the building. The loft will only circle the outer ring, leaving the inner ring open to the ceiling, which will have a large central skylight. There will be a full wrap-around porch with the southern hemisphere enclosed as an attached sunroom/greenhouse. Solar PV & thermal panels will be installed vertically on the southern loft walls due to the low Solar angle at 65 deg N.
Foundation & floor: Open pad & pier, approximately 2-4' above grade*. We will install floating concrete pads (on undisturbed soil) with concrete piers, on those we will install posts on permanent leveling jacks (just in case we get some frost heave). * We need to raise the house at least 2' above grade with an open crawlspace to make sure we don't melt the permafrost and sink our house; plus it keeps the house from flooding during spring thaw. We will be hanging the main floor from the posts, rather than building the house on top of the floor. Plumbing: We'll be using PEX and having only one "wet wall" on the inside of the house for the shower, sink & kitchen sink. Water heating will be through solar thermal assist and a water jacket off the woodstove, stored in a electric water heater that serves as our power sink if our PV panels run hot during the summer (it won't be running continuously, just when we have surplus electricity). All the PEX will be through a manifold so we can shut off and drain the entire system from one location. Water will be pumped from the well, to a buried storage tank, then into a pressurization tank in the loft (our property is basically flat)... both pumps will be electric and hand-operated. We will be using a composting toilet (bucket & sawdust... dump on compost pile) so there will be no black water. All the other greywater drains in the house will empty out into a subsurface irrigation system in the garden. Electrical: Gungnir is the electrical engineer, so he'll have to figure out the details, but... Combination of Solar PV, Wind Turbine & Gas Generator (converted to ethanol later... diesel gels at our temps, so not an option), the regulator, inverter and battery bank will be inside (in the utility room) to keep them from freezing. All wiring will be run behind baseboards and molding, or along beams/posts, so we don't break the building envelope or have to cut channels into the straw bales. We aren't planning for a lot of electrical gear, so we don't have to run a lot of cable. We'll have a 12v DC chest freezer (for the summer) and tiny refrigerator (for leftovers)... everything else goes in the root cellar, which will stay 35-40F year round (if we can keep it from freezing), everything in the freezer will stay frozen in the cache during the winter (no power needed). Rootcellar: still trying to determine if we want this directly under the house or not. It would be convenient to open a trapdoor in the kitchen or utility room, but then we might run the risk of our house sinking if we melt the permafrost. Plus, having all your food inside the house can attract bears... so it might be better to store things away from the house. We'll have to decide when we get there and do more soil surveys. If things are super-stable gravel and we can find a large enough space that is permafrost-free, we may just install an ICF basement and foundation instead... which will be tough since we'll have to mix and pour all that concrete by hand (no pump truck can get to our place). OK - so that's the basic plan and our thinking to this point. I'll try to scan some of my architectural drawings and post them to our blog when I get some time. We will definitely post pics as we're building. Meanwhile, you can check out The Roundhouse Project, Simon Dale's Low Impact Woodland Home, and Tony Wrench's That Roundhouse for more conceptual data. Originally I wanted to build a hobbit hole kind of a deal, but with permafrost this wasn't an option. 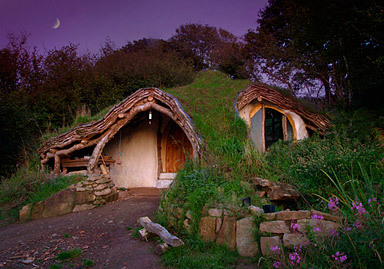 I think these kinds of buildings strike the balance between the Hobbit hole, and being required to build above ground. You need to get yourselves up here, summer is half over. ldlark - we're moving as fast as we can :) We'll just have to hustle when we get there!